SARAH'S BLOG OF FUN: Monster High: Boo York, Boo York On DVD Now And A ~~Giveaway~~ 15 Winners!! 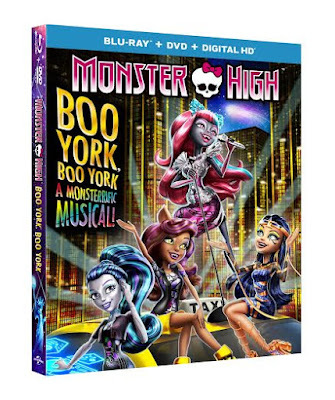 Monster High: Boo York, Boo York On DVD Now And A ~~Giveaway~~ 15 Winners!! It’s fright lights, big city when the Monster High™ ghouls head to Boo York! Cleo de Nile™ is invited to attend a fancy gala celebrating the return of a magical comet and, of course, she brings along her beast friends. But their trip isn’t all fun and frightseeing because Nefera, Cleo’s sister, uses the comet’s powers for her own spooktacularly sneaky plans. Can the monsters unwrap the mystery of the comet in time to stop Nefera? Find out in Boo York, Boo York, the first-ever Monster High™ musical, featuring eight original songs. This looks really cute!! Would you like a copy of your own?? I am very happy to be able to give away a copy to 15 winners!! This would make a perfect Halloween night movie, or even a great stocking stuffer!! Halloween is also my dad's birthday....so we all go to my parents' house for a halloween/birthday party. WE crave our pumpkins then pick up our pumpkin shaped pizza at Papa Murphy's. Then get their costumes on and go trick & treat. Then home to hand out candy and watch Halloween specials. We put up lots of decorations all over the house, both inside and out. I handmade all our costumes. We have pumpkin shaped pancakes and then carve our pumpkins. We go trick or treating and then on a haunted hayride. The day ends with a bonfire and spooky stories. decorating house and the yard together and going costume shopping together and carving of the pumpkins! I cook a Halloween themed dinner on Halloween and we set up a Halloween decorated table in the driveway with the neighbors and hand out candy while my husband and I take turns trick or treating with the kids. Sometimes we collect for Unicef also. The kids and I do Halloween baking and crafts. We decorate the house and make Halloween goodie bags filled with treats and trinkets for the trick or treaters. We also get a pumpkin shaped pizza for the end of night to enjoy :) And we spend some time watching Halloween specials together. We love decorating and choosing costumes! New to your blog! And I love it!!! We always have a chili dinner and give out candy to the trick or treaters! We love to visit the apple orchards and pumpkin patches. We go pumpkin picking and decorate our pumpkins, yard and inside the house. Sometimes we get dressed up in costume.